23/55 Reagen Sulewski Guy Maddin makes David Lynch look like Robert Zemeckis. Something of a legend in the underground filmmaking world (he's the recipient of a Lifetime Achievement Award from the Telluride Film Festival), Winnipeg filmmaker Guy Maddin looks to make the leap into the "mainstream arthouse" with his latest film. His earlier films, like Tales from the Gimli Hospital and Careful are considered classics in some circles, but Maddin is still unknown to most moviegoers. 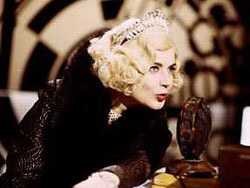 Isabella Rossellini plays a legless beer baroness in Depression era Winnipeg. To boost beer sales she puts on a global contest to determine what is the saddest music in the world, and musicians from every corner of the globe flock to Winnipeg to win the big cash prize. Among the competitors is a pair of estranged brothers - one a depressed cellist still mourning the disappearance of his wife, the other a down on his luck Broadway producer who has his amnesiac, nymphomaniac, sleepwalking girlfriend in tow.